The website I created for the final project is completed. Please click here to view it. Thanks for a great semester, everyone! This is definitely, definitely, DEFINITELY rough.. I’ve been completely outside of my comfort zone with this: but picked up some handy new tricks. 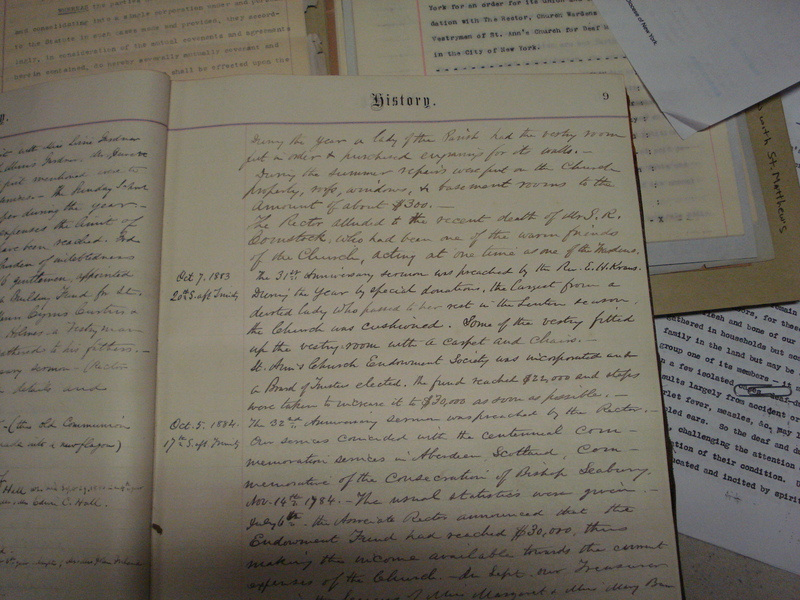 There is dummy text in place, and many photos are up from the archival sources – but full citations are missing. My mapping tool is still in the early stages as well. The collaborative emphasis of this week’s readings (and our discussion of digital history/humanities this semester) has been one of the most attractive features of work in this field. It serves two of the major concerns I frequently face as a scholar – one, it broadens the field of study – making use of more hands and minds to cast a wider field of study – and two, it centralizes critique and conversation in a way that encourages participation of multiple voices. Working on a small subject field, with resources scattered in various repositories that are frequently overlooked for categorization or consideration- digital tools and curated digital archives have unlocked a great deal of the hidden histories of people with disabilities. Placing these conversations in public, accessible spaces increases the participation of minority voices. Beyond that, it locates me in a conversation with scholars that challenge my thinking and encourage me to consider my role in the process. Unfortunately, as I read this week, I was struck by the lack of collaborative digital deaf studies resources. Deaf studies as a field makes use of digital tools – they encourage collaboration, as a rule, but other than a wiki project proposal a few years ago, I haven’t seen any major efforts to cultivate scholarly discussions outside of walled institutions. We have a digital journal, I’ve mentioned before: the DSDJ, but looking at the resources this week, I thought about the process of peer review that could occur. If videos were uploaded in smaller pieces, commentary were available on the page- enabling participation and dialogue with community members using technology like vialogues – this could make the peer review process more engaging and result in stronger works. I’m thinking of more efforts that could be made to enhance the use of the DSDJ as a tool and a resource – it might be worthwhile to send them an email and see if they could do something similar for at least one article per issue. This week’s readings were cause for reflection for me. I thought a lot about the ways in which I constructed my courses (and my use of powerpoint). For the most part, I taught the way I learned – with a coursepack of readings and sources, with five page papers and tests that asked you to recall “facts”. But I started to think also about how I had deviated from that – asked my students to take opposing positions and debate their interpretations, required them to make “mashups” of newspaper articles that tackled particular content/concepts, and encouraged them to use digital/analog media to represent change over time. I measured whether or not this was effective by the depth of our discussions as much as their scores on essay questions. But more than instilling a degree of teaching anxiety, the readings got me to consider more broadly what it means to teach/learn/do history. Rather than a process of ensuring that students can fill in enough Scantron bubbles to demonstrate that they “learned” something, I liked how Kelly described the act of engaging students as a “tension” , as something that “destabilized their assumptions” (in chapter 1). (Similarly, Wineburg, writes, that historical teaching teaches us “to go beyond our own image, to go beyond our own brief life, and to go beyond the fleeting moment in history into which we’ve been born.” 498) Learning can be remarkably uncomfortable and it can also be challenging and fun. The AHA article reached this point as well- that its less about teaching students what to think, and more about teaching them how to think. Reformulating teaching practices from these positions forces us to reconfigure how we use the classroom and what sources we use. Rather than approaching “the web” as a barrier teachers have to reach across to impart knowledge to students, “We can think of the web as the untextbook” (AHA “Abundance”), something that destabilizes a rigid teaching approach and encourages us as scholars to consider useful and effective means to develop historical skills/thought in our students. Perhaps the internet presents an obvious, if not superior, means of doing just that- as McClymer states in the introduction, “On the web there is no scholarly filter.” And as the examples presented by Kelly demonstrate, students should develop the ability to assess and use the abundance of information available. I’ve been playing with the Google ngram viewer. I wanted to test it’s features and the best way to test it was to use terms from my area of research. In this chart, there are no real surprises. The comparison of terms demonstrates the changes in how sign language was described – in the nineteenth century, “language of signs” was the accepted phrasing, the sharp growth of “sign language” corresponds with what we know about the rise of oralism, and American Sign Language is a relatively new term that differentiates ASL from other sign languages. The introduction of signed systems in the twentieth century – is clear here as well with the appearance of “Signed English”. My next chart is a bit more interesting. I wanted to look at changing social perceptions using the Deaf Pride/Deaf President Now movements as key features. DPN was a dramatic, public protest in March 1988. The spike on the graph at this time is clear -but the secondary spike is interesting – clearly, after the event occurred – it became the subject of considerable discussion, though interest has waned. The concept of “Deaf rights” makes an appearance at this time, but does not appear as frequently. “Gallaudet” is difficult to parse out -the spikes don’t align with major events/moments with the university – I wonder if there is confusion between the place / family name. “Deaf community” is the phrase with the longest history. The growth of it’s usage in the 1960s lines up with the burst of sociological/linguistic study of deaf people as a group. The 1980-90s development of “Deaf culture” makes sense with the Deaf Pride movement and the DPN event – as well as a flurry of texts that adopted cultural/minority perspectives. “Signing people” is a new phrase (as evidenced by the graph). So, again – no major surprises. It’s a cool tool – but limiting. I found myself frustrated and wanting to search within a specific corpus of texts (ie books relevant to these subjects). Using specific search terms like “deaf” were ineffective because the word is used largely within literature without describing/pertaining to deaf PEOPLE. It would be cool to be able to look across deaf studies texts/articles/pedagogical materials and identify changing terms in conjunction with larger social changes. 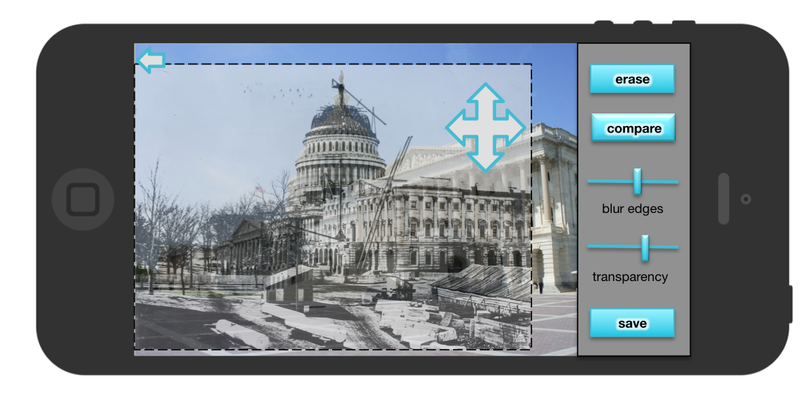 For historians concerned with the construction of physical space there is a lack of real-time visual comparison tools that allow researchers to juxtapose historical images with contemporary space. 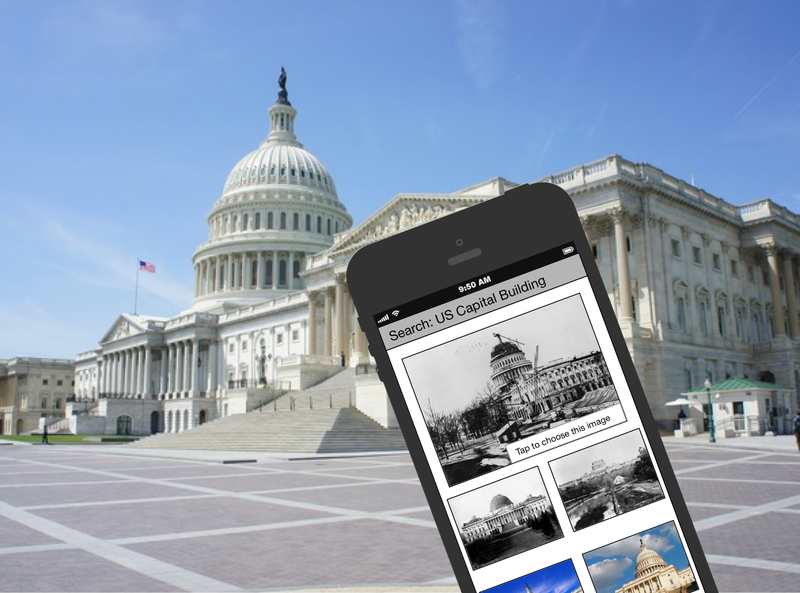 To resolve this issue currently researchers may bring analog photographs or use mobile devices to display digital images, however, it is unrealistic to expect people to carry historical objects to the site, nor is the current use of digital images effective. Both approaches continue to be imprecise because static historical images cannot be manipulated or merged with current views in real time. Neither method allows for intensive examination of change or development. 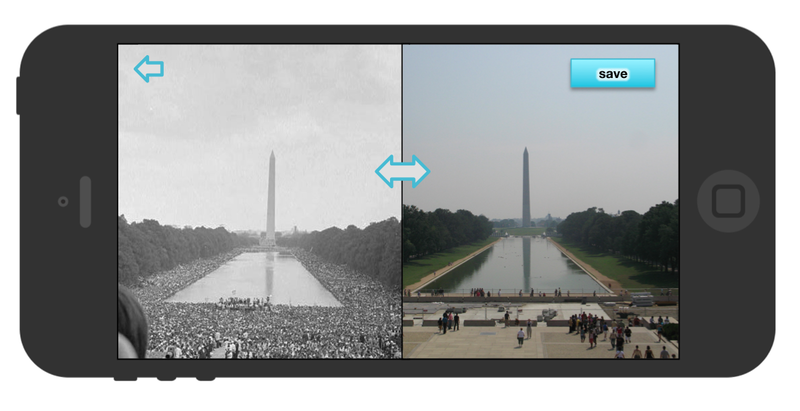 In response to this problem, I propose that History/Today, a mobile application that superimposes historical images on the camera viewer of your mobile device, will enable access to a great deal more than a single person could carry with them. The addition of modification tools facilitates dynamic interaction between viewer, history and space. As a form of augmented reality (AR), History/Today would allow researchers to reconstruct the context in which an image was captured providing for the comparison of contemporary spatial organization and architecture with that which has existed in the past. Upon opening the app, users would be prompted to make choices about how the program should function. Users may choose images using a search feature (drawing images from a search engines using search terms provided by the user), by allowing the phone’s internal GPS to locate them on a map, or by utilizing an existing photo from their mobile device. In each case users will then choose an image from the populated list. 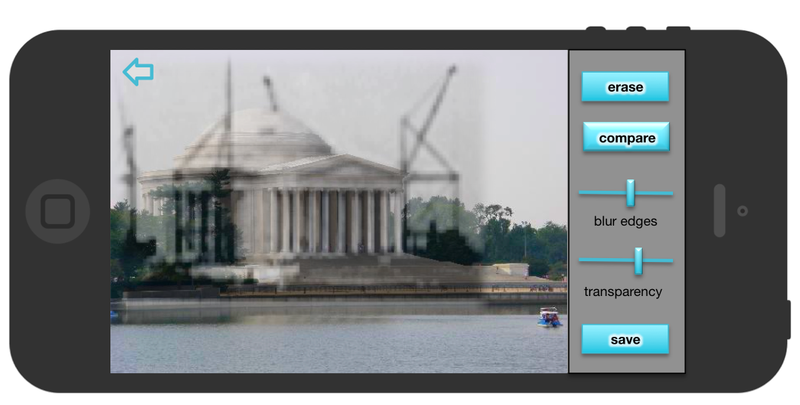 History/Today accesses the phone’s camera and superimposes the selected image on the camera viewer. 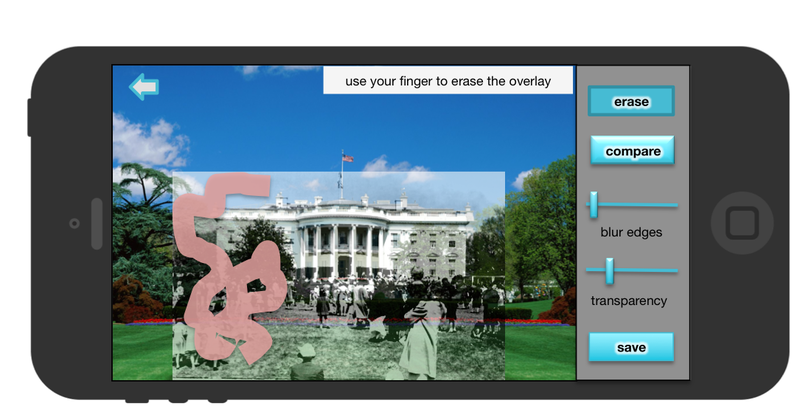 The interface includes a sidebar that enables the modification of the AR display. In my paper I described each of these features at length, they include: a search function, geolocation function and the choose from existing function for the population of overlay images, these images can be modified by being moved/resized, compared, made more or less transparent, lines blurred or portions of the image can be erased. Following a period of modification, users may then choose to save the composite image they have generated. Existing tools and resources have attempted to provide resolution to these problems but do not adequately meet the needs of researchers. In an effort to respond to these concerns, I have added or modified existing technology to better serve the needs of this population. A real-time overlay provides users with greater flexibility and allowing them to capture images that are precise and clearly aligned. Comparison photos are quickly and easily constructed with the click of a button. Harsh boundaries between past and present are mediated using the transparency, blur and erase functions. Further, using erase allows for the selective juxtaposition of past and present with interesting results. Giving users the option of drawing from their own database enables researchers to bring images of interest to the center of their exploration. 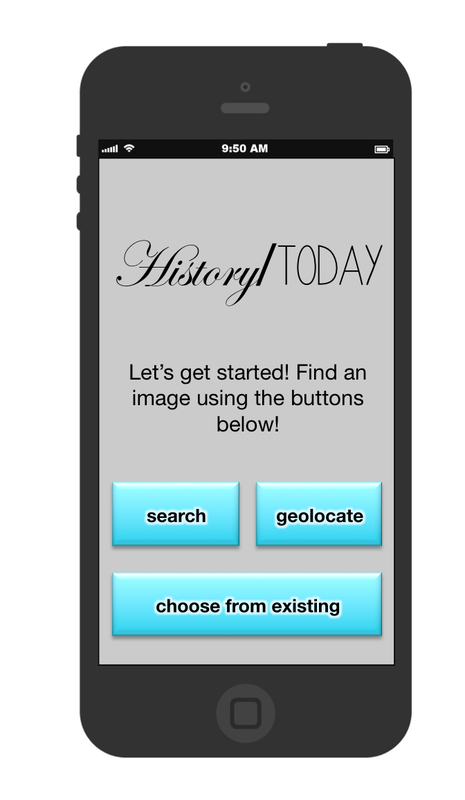 History/Today should and can be responsive and the application of this tool is limited only by the exploration of its users. Spatial Histories – Gallaudet, a case study? I’ve been thinking about this project for a long time and looking forward to this week’s readings and discussion. After reading the book The Ugly Laws by Susan Schweik, I’ve been fascinated with the spatial organization of cities in relation to ideologies of difference. I remember broaching this topic with a former professor. At the time I was working on the emerging concept of DeafSpace and interested in a historical discussion of how deaf people orient themselves in space/construct spaces that respond to their unique sensory experiences. I was dissuaded by my professor – probably because of scale and a general distrust of using digital tools. But this week’s readings gave me a bit more ammunition in that discussion. Richard White’s discussion of Lefebvre’s The Production of Space was especially meaningful for me (it’s in my amazon shopping cart now). But in general, the thread across these readings was that spatial history is not “new”. That we use space, discuss space, contemplate space as historians. Or as Guldi succinctly described in her post about The Spatial Turn in History, “The historian’s route, traveling across diverse landscapes, was the single continuous thread that made possible the forging of an integrated story about the modern nation.” What is “new” is the digital component, the ways in which technology enables us to access and interpret and display information differently. “The spatial turn represents the impulse to position these new tools against old questions.” Jo Guldi, again. Deaf residential schools are the locus of American Deaf culture. They serve as both catalyst and repository. Most deaf people are linguistically and culturally separated from family members- schools often represent their first access to social networks and language environments that lead to cultural identification. At the same time, historical study of the deaf community often begins, and is sometimes limited to, the resources at deaf residential schools. As institutions they produce and retain an abundance of biographical and social information about students and teachers. Frequently these schools housed printing departments and published newspapers that distributed information about community members and created ideological networks that connected deaf people across the country. Gallaudet University is a contained unit. The spatial location of the institution hasn’t changed since it’s founding in 1864, but the spatial arrangement of campus and surrounding city has changed and continues to change. This means that research questions can be carefully and fully considered. The project that I envision has two parts. The first examines the relationship Gallaudet University had to the city of Washington DC. I threw together a quick comparative image at the beginning of this post. The school was initially located on the outskirts of town, and as the comparison reveals, it the 99 acre campus has been swallowed up by the city. Second: I’m interested in the changes to the campus itself. How was the land was divided and organized? How were the buildings constructed and what purpose did/do they serve? 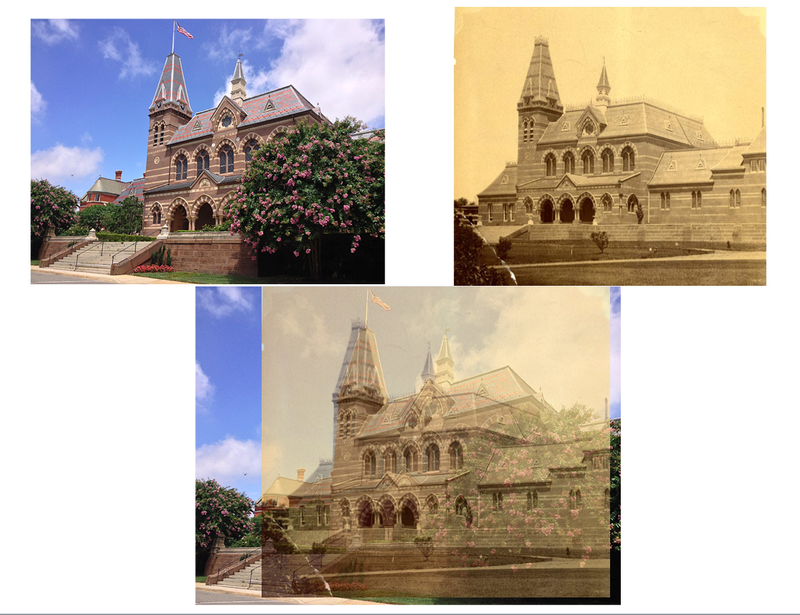 Using a digitized catalog of photos available online by Gallaudet University, I’d like to create realistic comparisons that demonstrate these changes. It would be great if all of this could be compiled into a sort of historical walking tour of campus similar to the one created by the Missouri History Museum. I’m still thinking about how the project would work, what tools I’d want to use and who my audience would be.. but this is where I’m at right now. Posted on October 20, 2013 December 13, 2014 Categories Clio1, Digital Portfolio7 Comments on Spatial Histories – Gallaudet, a case study? My alma mater put up a digital timeline of Deaf History and…. it’s painful. Maybe as a result of this class, but I find myself disappointed. I hate to be too critical, but this is so clunky. It’s great that so many of photographs that are generally hidden away in the archives are finally on display – but there’s no…. substance? No connecting thread – other than chronology. Even the search function on the bottom right, doesn’t pull up every item on the timeline pertaining to say.. Women. There’s no effort to interpret or to connect. This is frustrating because I know how much effort and energy went into producing something like this – I wish that it would have been taken to the next step. The items could be linked to pages that create a narrative or enable the viewer to explore more content pertaining to, say, The Founding of Student Body Government in 1948. It could all be linked to the oral history archive already available online – encouraging people to engage with the content in new ways. It’s a good step.. toward embracing digital means of communicating historical information.. but we need more. I spent a lot of time yesterday playing around on Omeka. And despite my efforts I don’t have a lot to show for it. I found myself going through old folders of data, eager to label and identify my objects carefully – only to realize that I’d developed multiple labeling systems or had only tagged half of my content. I have a new appreciation for the amount of planning and foresight required in the organization of huge datasets and primary documents. But the activity also raised some interesting questions for me about traditional scholarship (in which I access archival materials and write about what I find, providing citations) and digital scholarship (where I want, in part, to SHOW you the things that I found) and made me think about getting permissions for and digitizing all of the documents I’d love to include in a digital collection. Given that sources are housed in different archives (and that none of them are digitized and most of them aren’t indexed) the project in my mind just tripled in complexity. Where does one even begin? Given our readings this week and our discussion about gated content – it’s interesting to see JSTOR responding to the needs of an individual researcher. The Register & Read program gives limited (very limited) access to articles – three online-only, per month. It seems that in response to users, JSTOR has decided to expand on access for individual users with the JPASS. While it is a far cry from the amounts that institutions pay, what do we think about the economic barrier this creates for individual scholars? A number of us had a scary realization in Colloquium – suppose we complete our degrees but are unable to secure full-time positions? How can we continue to maintain a level of scholarship without access to documents and resources locked behind paywalls? JSTOR seems to be responding to some of those concerns here, but falls short of full open access.